Not necessarily beautiful-- but stoned. Yeah this is a real guitar you can play! Do not adjust your screen! We actually featured the Bender Distortocaster a few years ago. This week's profile on KOZM Guitars sorta reminded me of the Bender models. 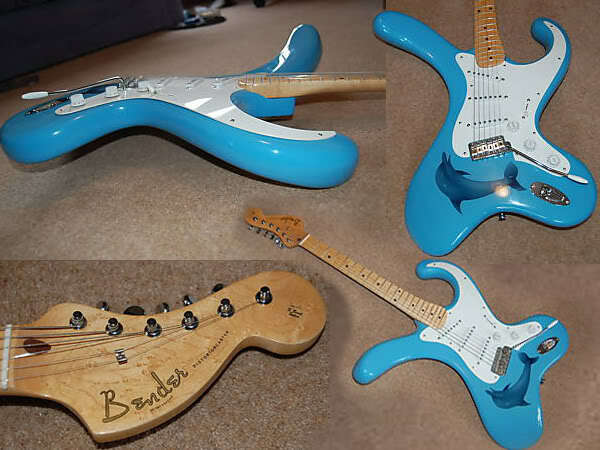 UK builder Brian Eastwood produces the Bender series among other unique & bizarre models. His take on the Tele is called the "Jellycaster". 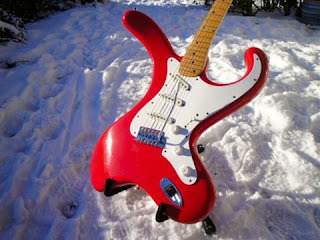 Brian Eastwood is NOT the same guitar maker as retro guitar outfit Eastwood Guitars. The blue collage was originally created by G. Wilson at GUITARZ blog (world's longest running guitar blog!) from pics in an old eBay listing. The red one is just floating about the web. I guess these guitars are supposed to be more ergonomic as well as unusual looking. They also appear to be dolphin safe. Be sure to check out the Brian Eastwood link for more details and interesting creations.